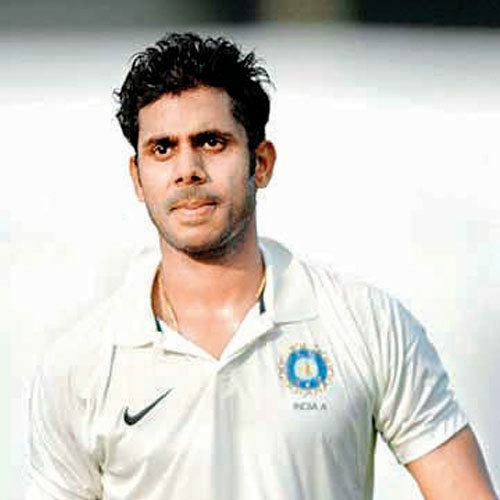 Manoj Kumar Tiwary (Bengali: ) (born 14 November 1985) is an Indian cricketer. He is a right-handed batsman who bowls occasional leg break. He represents Bengal in domestic cricket and Delhi Daredevils in the IPL. An aggressive right-handed batsman, Tiwary has gained attention from selectors and fans through his strokeplay and high run scoring in Indian domestic cricket. Because of his front foot play and ability to attack the bowler by charging down the pitch, many have compared his batting style to Englands Kevin Pietersen. Tiwary was named in the ODI squad to Bangladesh, however he failed to make the playing eleven after sustaining an injury in training, the morning he was supposed to debut. He eventually made his debut against Australia in the 2008 Commonwealth Bank Tri-Series in which he scored only 2 runs in his only innings. He was later included in the India team for the West Indies tour of 2011, as a replacement for Yuvraj Singh, who opted out of the series due to a lung infection. Manoj Tiwary played the 4th and 5th ODI in the series. He later got picked for Englands tour of India in October. He played in the 5th ODI and got 24 runs. He also played the only T20 and scored 15 runs. Tiwary was subsequently named in the squad for the ODIs against West Indies in November–December. He played in the 5th ODI at Chennai when India was down by 2 wickets for only 1 run in the very first over of the match. He then went on build a solid innings which got him his scoring maiden ODI century (104 not out) despite having cramps and retired soon after getting his century. Eventually India won the match by 34 runs and he was awarded the Man-Of-The-Match for this match-winning knock. Even after the unbeaten century, Tiwary was made to sit in the reserves for 14 successive matches following the century. However, he made an auspicious comeback as an all-rounder replacing leg spinner Rahul Sharma against Sri Lanka at Colombo as he took 4/61 from his 10 overs with his leg-breaks to restrict the hosts to 251/8. He took the wickets of Dinesh Chandimal, Angelo Mathews, Jeevan Mendis and Thisara Perera, and followed it with a fighting 21 from 38 at a tough time coming at 60/3. India eventually won the match as Virat Kohli scored an unbeaten ton. Tiwary also was picked for the Commonwealth Bank tri-series against Australia and Sri Lanka,but he didnt play any matches. Manoj Tiwary was again selected in the Indian team for the Asia Cup 2012 where again he didnt play any matches. Tiwary was also selected for the lone T20 against South Africa which was played celebrating 150 years of settlement of Indians in South Africa. Tiwary was signed by the Delhi Daredevils for a sum of USD 675,000 in the initial seasons of the Indian Premier League . He was traded to the Kolkata Knight Riders in exchange for Moises Henriques before the 2010 IPL season. In the auction for 4th edition of the Indian Premier League, he was signed by the Kolkata Knight Riders for a sum of USD 475,000.